Those who are following this blog will perhaps wonder why Python and not C++ :) The reason is quite simple, I wanted to improve my skills in Python. And what is better than to develop a project from scratch. The state of each branch of each project is shown. 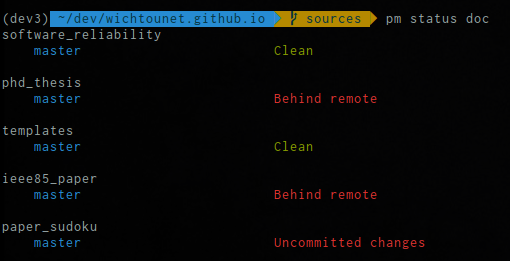 There different possible status (they are cumulative): * Behind remote: Commits are available on the remote repository * Ahead of remote: Some local commits are no pushed * Diverged: Behind and Ahead * Uncomitted changes: Some changes are not committed * Clean: Indicates that everything is committed, pushed and pull. As you can see it supports recursive submodules. 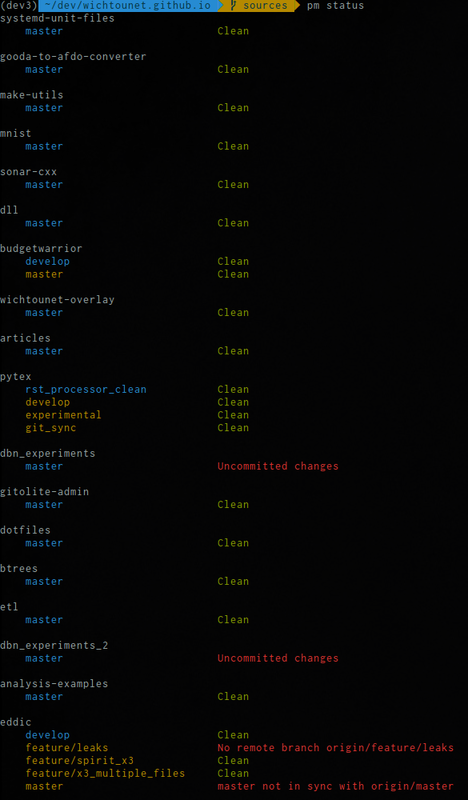 For each submodule it will indicate if there are new commits available or not. pm is not only able to show status of the projects, it can also fetch the status of branches from remote by using pm fetch. All the remote branches are fetched from remote. It can also automatically update the projects that are behind remote (equivalent of git pull) with pm update. Only projects that can be fast-forwarded are updated. For those interested, source code is available on Github.